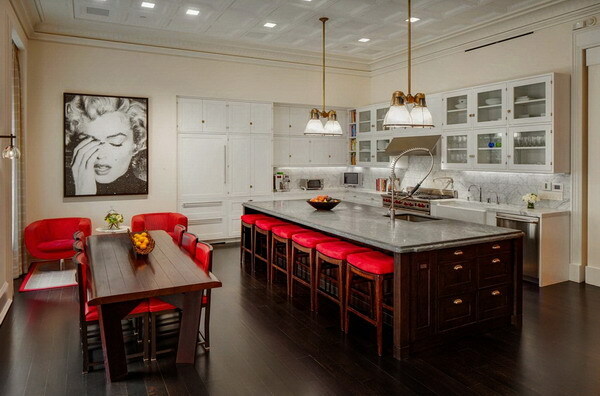 This is Mark Consuelos and Kelly Ripa’s penthouse in Manhattan, and it has a lot to offer. 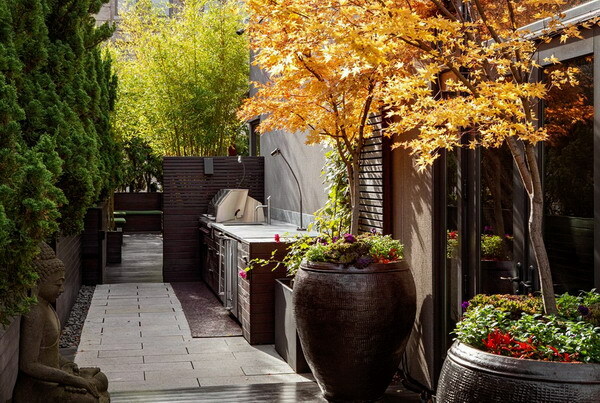 From the decadent interior to the complete outdoor spa space, there is something for every interior design enthusiast in this gorgeous city apartment. 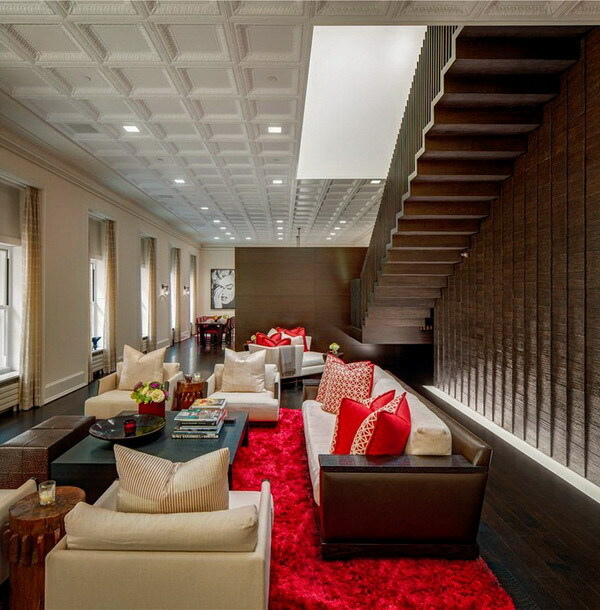 The designer successfully brought together red details mixed with modern white linens and dark wood floors. The main living space is open and provides plenty of space for guests and even house parties. The dark wood floors contrast with the white ceilings that have ornate recessed details. 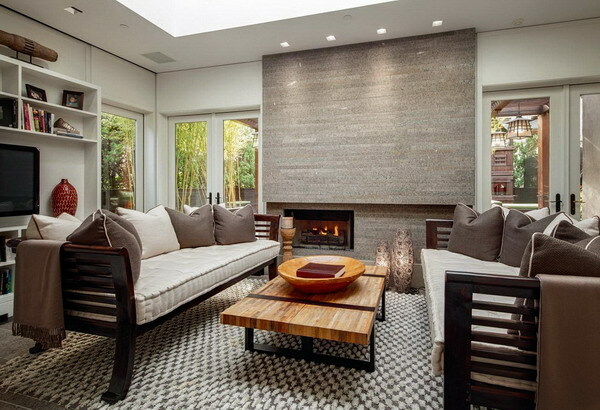 The red carpets truly bring the space together. 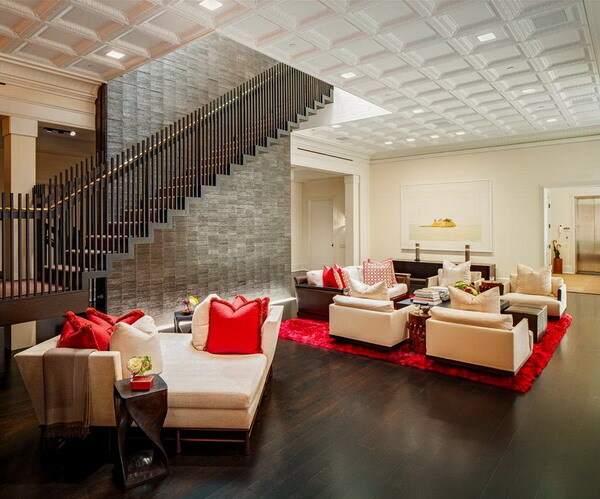 Another point of interest in the living room is the wall by the stairs that has a dark, stainless steel-like texture. While having a variety of textures, the apartment still looks thought out and modern. Also integrating red, the kitchen keeps with the trends of the whole penthouse – it does not go overboard with the trend or make it look too forced. The entire penthouse flows nicely from room to room. Modern countertops and a farmhouse sink complete the kitchen space and make it a usable space. 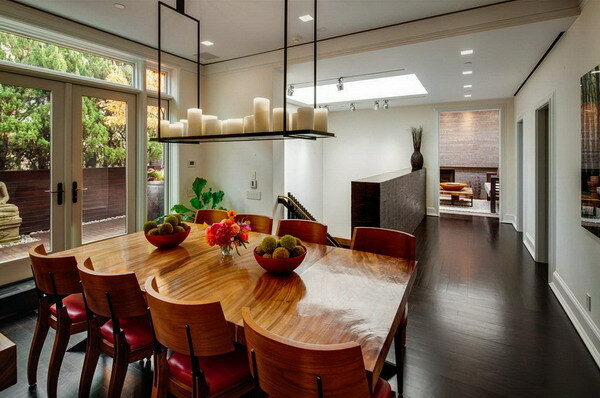 A huge island provides space for cooking and seating for six more guests. 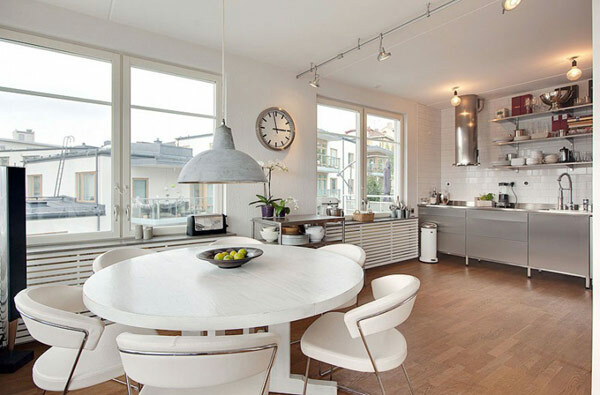 Stainless steel appliances add to the elegance of the entire space and make it efficient and usable. A black-and-white Marilyn Monroe picture was the perfect choice to go with. 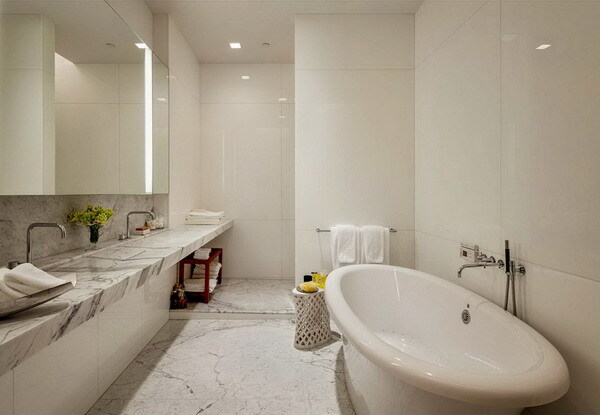 Marble floors and countertops create a peaceful and sophisticated oasis that is complemented by the white walls and the white tub. Such a beautiful, clean place to relax! 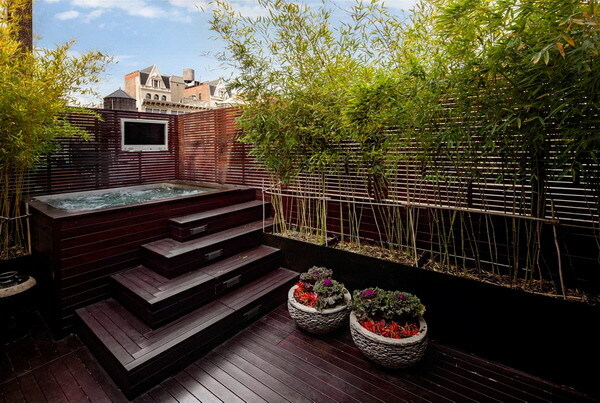 Complete with hot tub, grill and two televisions, the outdoor space is truly unique and lacks no creature comforts. 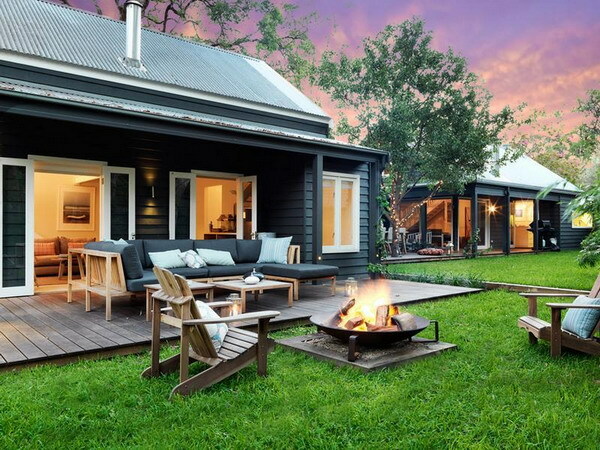 The dark wood and stone features create a retreat from the big city lifestyle. 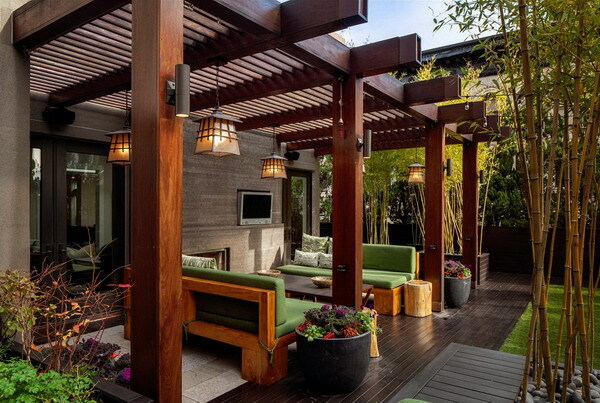 Bamboo and colorful foliage bring the necessary color to the outdoor space.